Gerardo Ortega Sanchez was so happy. “This scholarship means everything to me because I am an immigrant,” he said, smiling. The Washington High School senior recalled his journey to the United States from Mexico at just 5 years old, not knowing English at the time. 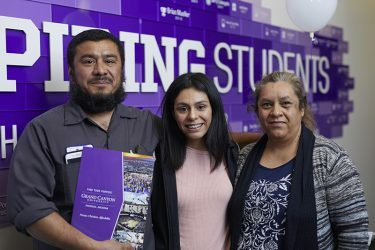 Gerardo Ortega Sanchez (left), with his parents, Maria and Gerardo Sr., was one of 22 high school students receiving a full-tuition scholarship to Grand Canyon University on Tuesday night as part of Students Inspiring Students. Sanchez was one of 22 high school students who received a full-tuition scholarship to Grand Canyon University on Tuesday night as part of Students Inspiring Students, a collaboration of the University, the GCU Scholarship Foundation, schools and businesses and philanthropic leaders. At its core, the scholarship program is about students helping students and the impact it can have at inner-city schools in Arizona. Each year, the University awards 100 full-tuition scholarships to students from inner-city schools who meet academic criteria and demonstrate financial need. Their stories epitomize the journey of life’s hurdles and successes and, ultimately, the importance of perseverance. 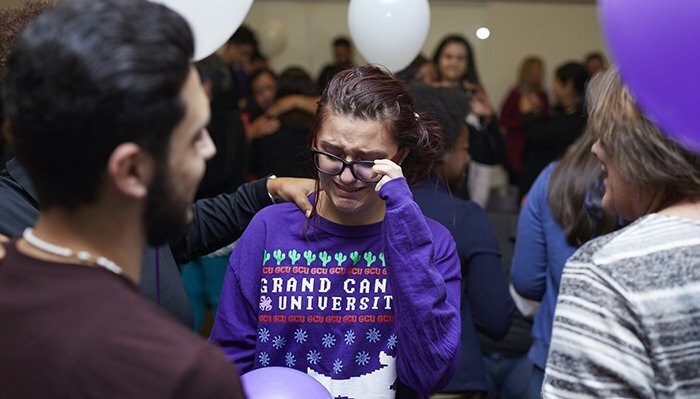 Dr. Joe Veres, GCU’s Vice President of Student Development and Outreach, said the recipients were hard-working children of ambitious parents who wanted to work and support their children. 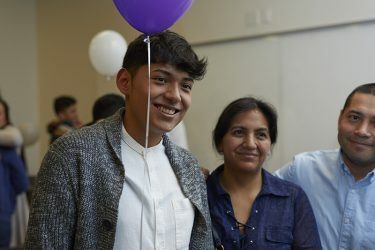 Sanchez, who lives in the U.S. as a DACA (Deferred Action for Childhood Arrivals) recipient, showed gratitude for his parents as well as their decision to enroll him in Orangewood Elementary, just down the street from his high school. “They knew I had to go to school, and that was my beginning,” Sanchez said. Glendale High School senior Amy Aguilar (center) expressed gratitude for her family’s love and support in making her dreams possible. After receiving his award, Sanchez was crying as he darted forward to hug his parents and older sister. For Amy Aguilar, a Glendale High School senior, there was no hiding the excitement. As her name was called, Aguilar danced her way to the front. 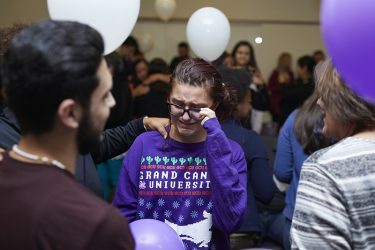 The news brought students and their families to tears. Aguilar has lived in Glendale all of her life. She said although she comes from a middle-class family, she remembers her parents making every effort to get her older sister through college. Under the terms of the Students Inspiring Students scholarship, recipients receive academic assistance at GCU’s Learning Lounge, its free after-school tutoring program, while in high school. As part of their full-tuition scholarship, students then pay it forward by putting in 100 hours a year of mentoring and academic support at a Learning Lounge site while at the University to the next group of K-12 students behind them. Aguilar hopes to be an early childhood education teacher. Sanchez said the journey has been “amazing,” and his goal is to keep moving forward. Having had a strong interest in arts, crafts and Legos as a child and seeing how his father worked fixing cars, Sanchez said he hopes to pursue a degree in mechanical engineering. Both said their ultimate dream is to give others a chance to live the American dream. “There are opportunities and your hard work does matter,” Sanchez said. Contact Jeannette Cruz at (602) 639-6631 or jeannette.cruz@gcu.edu. I am also a SIS recipient! Congratulations to all the students and families! Welcome to Grand Canyon University, a fine institution of higher learning! Congratulations to each of you, and your families, on your academic endeavors and resilience! May God bless each of you! Anything possible! You are the future! Remember, your gifts will make room for you and put in partnership with great people – Family, Dr. Joe Veres, and GCU faculty. Go Lopes!! !